Andrew does apparel design during the day, and in the evenings and weekends he works on his digital dinosaur sculptures. One of the things that I really appreciate Andrew is his mention of the word ‘grit’ which can mean a lot of different things, but in a nutshell it’s being able to stick to your goals and keep moving forward. He is a big believer in keeping your skills sharp and that’s why he is also attending the Watts Atelier to continue to hone his skills as an artist. If you’re like me and were not aware of what an atelier is, it’s kind of like art school, but more compressed and far more affordable. Andrew has been taking advantage of the breakthroughs in 3D printing and has married his love of dinosaurs with his love of art, but producing dinosaur models didn’t happen by design. 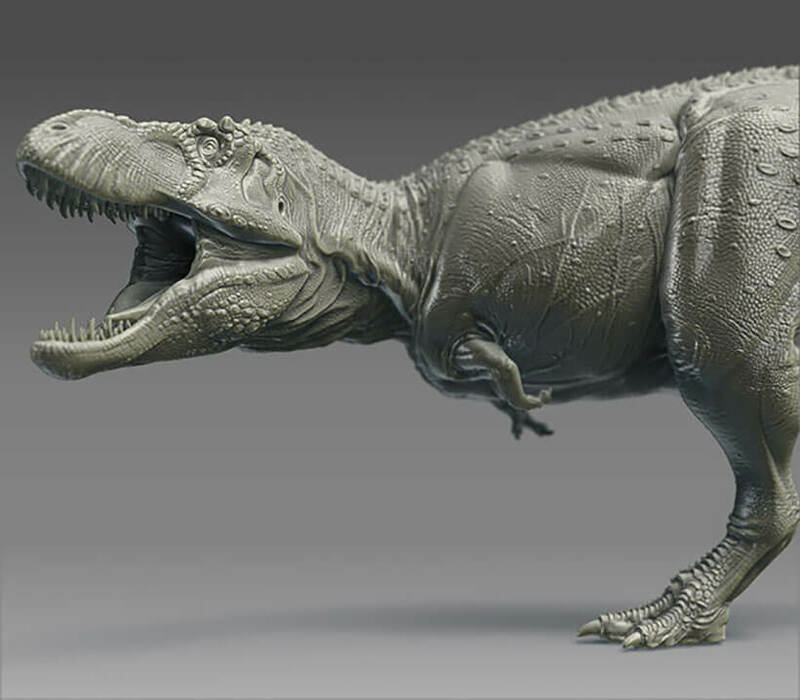 He started dabbling on and off with ZBrush and was eventually able to produce his first dinosaur sculptures. The light bulb moment came when he saw another artist arranging dinosaurs in a diorama scene and Andrew immediately saw an opportunity to create and pose his own dinosaurs in a set to be used in dioramas. Andrew’s motto for success is: perfect practice makes perfect performance. If you keep pushing yourself further and further and aim for the highest level of finish that you are able to do at the time, when you look back after a year of doing this don’t be surprised to see huge leaps in your abilities as an artist. Another one of the ways that Andrew approaches and levels up his skills is to go into a project with a clear goal from the beginning. By asking himself what he wants to achieve with this piece of artwork, he can then focus on developing that skill, and even if he isn’t successful, he can look back specifically at that and see why it wasn’t successful. He’s then able to take that knowledge into the next piece and continually improve. The great thing about this approach is that once you have learned a skill, you’ll have it forever, and you can move onto developing the next skill.